At last, website analytics and email data that work together – seamlessly and where we need it. More benefits have begun rolling out from the partnership between Google Analytics 360 and Salesforce, originally announced in 2017. 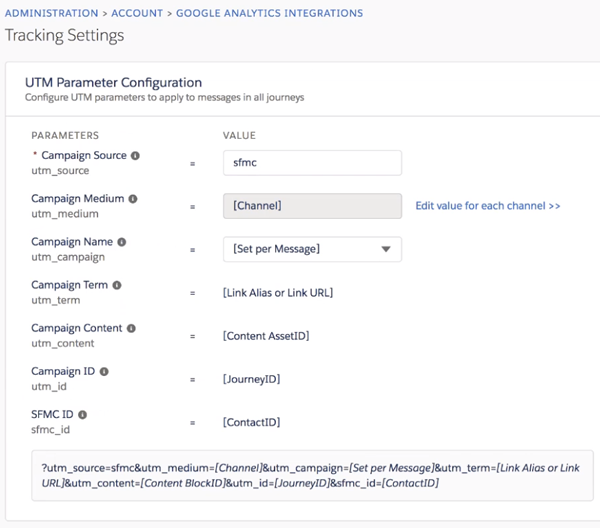 The latest feature to become available pulls campaign data and website performance metrics from Google Analytics and makes it available within Salesforce Marketing Cloud. One of the big challenges with email marketing tools has been the lack of insight into site behaviors. Typically, actions that occur outside of email, or landing page templates generated by the tool, are largely invisible or tracked in a separate tool. Google Analytics can often serve as our data hub, measuring the success of different campaigns from different tools. With key campaign data in Salesforce Marketing Cloud and directly associated with your email campaigns, marketers can get a more complete picture of their email journey and mobile marketing efforts and how they ultimately affect website behavior and conversions. Until now, there has not been a streamlined way to view Google Analytics data alongside email metrics. The most common solution to this problem has always been to use consistent campaign tracking parameters, export data from different systems, and mash them together in a third reporting suite. Now the process is turnkey, which means marketers have insights at an arm’s length. In order for this integration to work, you’ll need a few things. On the Google side, you’ll need Google Analytics 360, of course. On the Salesforce Marketing Cloud side, you’ll need to have Journey Builder. Depending on your Salesforce edition, you may already have Journey Builder or you may need to add this product on at an extra cost. In addition, you’ll need to ask your Salesforce support representative to discuss pricing to enable the Salesforce/GA360 integration for your account. The integration between the two platforms consists of information going in two different directions. Journey campaign information is added to emails that are sent out. When a user reads an email and clicks through to your website, those campaign parameters are used by Google Analytics to determine what traffic source and channel should get credit for bringing the user to the site, as well as a user identifier from Salesforce Marketing Cloud. As users browse your website, complete goals, or purchase items on your site – these are tracked into Google Analytics. Google Analytics 360 customers can then pass this information through to Salesforce, for easy reporting. The integration uses campaign tracking parameters from emails to associate website visits with a Marketing Cloud campaign. Salesforce will do most of the work for you – automatically setting the source, utm_source=sfmc, and dynamically setting the medium, term, content, and ID. You can customize the campaign name, even changing it for different steps within a journey. Once the accounts are linked properly (only someone with Admin access to both Salesforce Marketing Cloud and Google Analytics 360 can link the accounts) then you can begin viewing your journey performance all in one place, combining email and site metrics and comparing to goals that have been set up and ecommerce reporting. Salesforce has outlined detailed instructions for setting up the Google Analytics 360 integration here. Of course, this latest benefit is only helpful to organizations that have already taken the time to set up and configure Google Analytics on their website. Before making website performance information available to a larger audience through Marketing Cloud, a thorough review should be completed of your current website tracking. If you’re using landing pages for your campaigns, make sure you’re following best practices for analytics. In January 2018, Google announced automatic data import for Salesforce Sales Cloud. The feature automatically imports lead status change and sale information into Google Analytics when updates occur in Sales Cloud. This integration, coupled with a smart Goal setup, will help you track your email campaigns through to specific goals that occur, even off your website, like driving qualified leads. This is just one piece of a closer integration announced by Google and Salesforce last year. We can’t wait for future integration items that are planned, like using our Analytics 360 audiences in Marketing Cloud with direct marketing channels, similar to how we share audiences with Google AdWords, DoubleClick Campaign Manager, or Google Optimize. We’ll also be able to pass data back to Google Analytics from Marketing Cloud, like customer interactions that can be used to create audience lists. This Marketing Cloud integration is particulary significant because of how your Google Analytics data has been made directly available inside a third-party tool. For us at Luna, this is exciting because we’ve always had the philosophy that Google Analytics data has exponential value outside the interface. If you have quality web analytics, they should be combined with any other quality analytics – whether that’s email, store visits, POS data or other offline conversions. Seeing Google enable us to have quality, turnkey integrations and use our web data outside the confines of the GA interface has us excited about the future of the Salesforce partnership. When you combine this data with the offline conversion and qualified lead data from Salesforce Sales Cloud, we are approaching the free-flowing marketing data utopia we’ve all dreamed of.